Throughout February, Partners4Access is running a campaign to mark the annual Rare Disease Day on February 28. The '6P' campaign is aimed at creating awareness on the impact of rare diseases on key stakeholders and the need for partnership to achieve successful treatment access for patients. The 6Ps are Partnership, Patient, Policy-maker, Physician, Pharma and Payer. This week we focus on the payer who are decision-makers assessing the value of a product in the healthcare system. Presenter and Producer: Aparna Krishnan Contributor: Einar Andreassen, senior advisor at the Norwegian Medicines Agency. Einar is a health technology assessment analyst and reimbursement decision maker for the national insurance scheme in Norway. In the last episode of 2018, the P4A team look back at the events of the year and particularly on how their predictions on key trends in the rare disease space have fared. Presenter: Aparna Krishnan Contributors: Mergers and acquisitions - Sophie Schmitz Rare oncology drug approvals - Joanna Fernandes Future of new technologies like gene therapies - Christina Poschen Increasing prominence of societal burden data - Nader Murad Emphasis on planning Real World Evidence - Aparna Krishnan U.S drug prices - Max Rex The Weekly RoundUp team will be back in the new year. 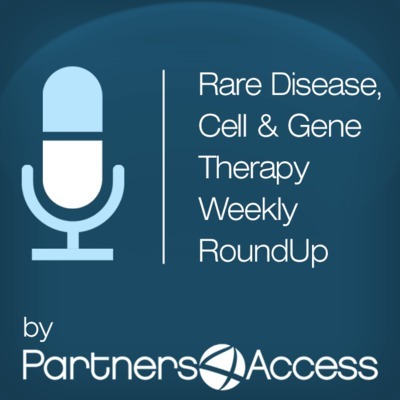 In its very first podcast of Rare Disease, Cell & Gene Therapy Weekly RoundUp, P4A discusses the US FDA's accelerated regulatory process for gene therapy; President's Trump's proposed drug pricing plan; the European Commission's proposal to amend SPC; the NHS England budget ringfencing; Irish government's attempt to trim the HSE and the new GDPR laws. Max Rex hosts with contributions from Aparna Krishnan, Corporate Affairs Lead and Alison Kneen, Vice President, International Operations.